Kusaga Taisha Shrine is located in the west of Nara Deer Park, very close to Todaiji Temple. It is a Unesco World Heritage site together with the Nearby Kusagayama Primeval Forest, an untouched forest for over 1,000years. 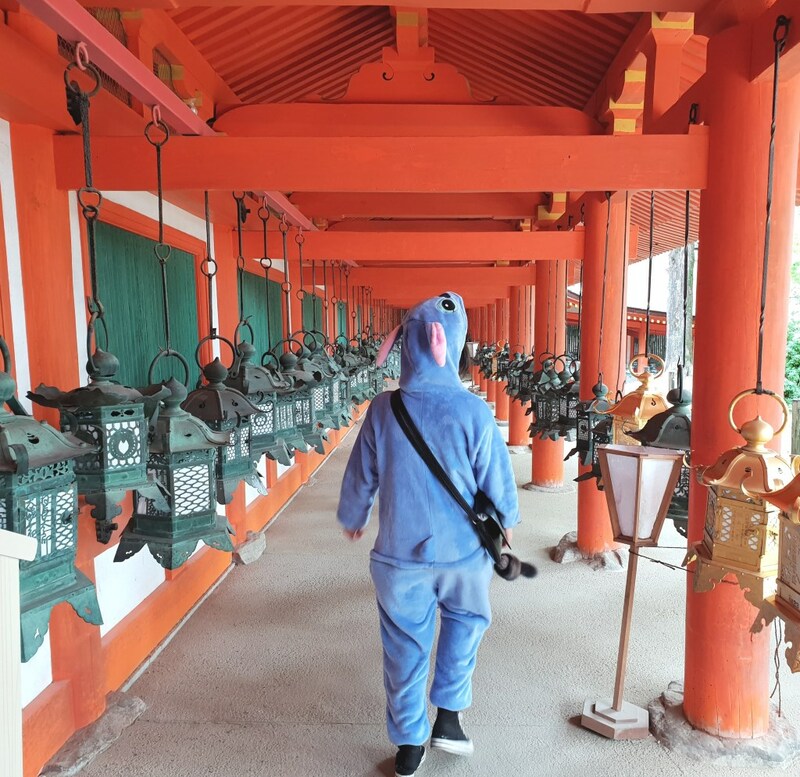 If you are exploring Nara Deer Park, you have to include Kusaga Taisha as it is one of the important and historical shrines not only in Nara but the whole of Japan. People who visit Nara deer park will usually include Kusaga Taisha Shrine and Todaiji Temple for a day trip, minimum of 6 hours in this area. Kusaga Taisha is famous for the thousands of bronze and stone lanterns that line the shrine’s halls and path. Each of the lanterns represents a donation to the shrine. Some are stone lanterns with green moss (as above) aged over a few hundred years old. It is believed that the sacred deer serve the Shinto deities of Kusaga Taisha Shrine. Legend says that the Kusaga Taisha god rode on the white deer. Visitors are washing up at the Deer Fountain/Chozuya before entering Kusaga Taisha Shrine. Chozuya also was known as temizuya, a place for you to wash before praying. Worshipper washes their hands and mouth. Do not drink the water. There are several small shrines in Kusaga Taisha and one you should not miss is the main shrine which cost 500 yen to enter. Wooden Plague also was known as “Ema” can be seen in most Shinto Shrines in Japan. The Ema wooden plague here can be seen with the shape of the deer. Write down your wishes and when “Kamisama” or God in English read it, your wishes will be granted. This is at the entrance of the Hondo or main shrine. The number of tourists visiting this place is pretty scary. There are 4 Deities enshrined at Kusaga Taisha, known as the Great Deities of Kusaga are enshrined respectively in their own splendid Kusaga style altars. The Deities’ names are so long so I don’t bother to tell you here. The first three end with “mikoto” which means god or goddess or highness. The last one does not have “mikoto at the ending. Once you entered the main shrine, you will notice a huge giant tree next to the Hondo or the main building. That’s the 1000 years old tree. It is quite impressive to see the thousand years old sacred tree here. A blend of gold and bronze lanterns line up the path and this is the best spot to shoot photos of Kusaga Taisha. I would say one of the icons in Kusaga Taisha. The greenish bronze lanterns are the older version and the golden lanterns are the more recent one. Equally beautiful. At the back of the main shrine, there is a dark room called Fujinami-no-ya which fills with many lit up lanterns. It was once used as a study area for priests but now hang with many lit up lanterns and open to the public. Go experience the mystic atmosphere, can be quite eerie. Warn you. Toro is the traditional lantern made of stone, wood or metal. The name of the donor is inscribed in the lantern. This one was donated by Toyota Corolla Nara company. Walking to other little shrines around Kusaga Taisha Shrine. 2000-3000 lanterns in this area. The outdoor stone lanterns are cover with green moss. Meoto Daikokusha is a sub-shrine near Kusaga Taisha, which is popular among couples which wish for a happy marriage. The “ema” wooden plague in this shrine is with the heart shape. Couples pray for long lasting relationship and single pray for love and find their Mr or Mrs Right. Deer in Kusagayama Primeval Forest is timid and they don’t dare to come too close to human. They are not as brave as the one near Nara Park. Still very tame. Don’t you think the Japanese student Uniforms are so cute, with distinctive sailor outfit? Girls wear skirts even in cold winter. There is a small museum displaying part of history and artifact of Japanese heritage. If you are interested, don’t forget to go in. At the entrance of the museum, are the omiyage or souvenirs counter. These older deer look fierce, just look at their eyes. And they have antler too. Beware of deer with antlers but most of the antlers are already cut. This is to prevent the deer kickbutt at visitors. Kusaga Taisha Shrine is the Unesco site in Nara, the shrine is famous for its thousand lanterns. You will still see deer roaming around in Kusaga Taisha. The nearby attraction is Nara Deer Park and Todaiji Temple. You can spend the whole day in this area. The laterns are just a beauty to look at. So detailed and perfect every single one. The journey there looks well worth it! There are several type of lanterns, the stone lantern, bronze and gold lantern. Pretty interesting to see so many line up at the temple complex. This looks so beautiful!!! Love the pics! Just stunning. I love the idea of the leaving your wishes in the different shrines on plaques. How wonderful and symbolic. I may have to start a similar thing for us here. What a lovely journey. The wooden plaque is called “Ema” in Japanese and common practise for which Shinto and Buddhist worshippers write prayers or wishes. As a ritual, the ema is a means to communicate wishes to both priests and the kami. The 1000 years old cedar tree standing tall next to the Kusagai Taisha shrines main hall. It is so huge you cannot miss it. This looks like and amazing place to visit! I love lanterns and would enjoy seeing something like this in person! The lanterns in Kusagai Taisha are over 2000-3000 pieces, bronze, gold and stone version beautifully line up the temple. Pretty amazing to see and great for photo shooting. How beautiful! I love visiting shrines! So much to learn and see. Shrines and temple are actually different in Japan. The look can be a lot different too, eg the Shrine usually has a red Toori gate while temple usually don’t have. Shrine is related to Shintoism which is originated in Japan but temple is based on Buddhism which has come down from India. What a fascinating feature on Kusaga Taisha Shrine. I have never been there but at least I got to see its beauty through your post. Thanks for sharing! I think the dear Wooden Plague is pretty cool, do wishes really come true? I would have to try it out, if so. The heart wooden plagues, that’s something I could use in my life too. Overall, look like an awesome place to visit.